Maybe it’s because the I’ve been meditating on similar themes in ef~a tale of memories, because it turns out the Fuko arc is just as much about memory too. (And without a nasty love triangle added too.) It also helps that we have gotten to know Fuko a lot better in the past few episodes, her as well as her engaged older sister Ibuki-sensei. The central theme of Clannad is family, of course, and it works when Nagisa’s mother breaks down at the end of episode 8 and grieves over her lost memory because Fuko is, in some way, part of her family too. Owen has also pointed out, rightly, that this arc is being handled with much more emotional restraint than in previous Key works. They’ve finally learned: no need to jerk the tears out. Just show them sad situations with characters worth caring about and the tears will come on their own. Episode 8 also answered a question that I’ve been asking–why don’t they just visit the “real” Fuko in the hospital? Now we know why, and it’s a workable answer within the context of this story. To be forgotten is, perhaps, worse than death. We have gravestones precisely to remind us that there was a person with this name in our lives. We call funerals memorial services. This arc is yet another instance of the idea that people literally disappear when they are forgotten; it was explored intellectually in Serial Experiments: Lain and it’s prominent in Chihiro’s storyline in ef. I find it a very powerful, primal idea, and the increasing number and closeness of people who are forgetting Fuko and her starfish grows sadder with each passing episode. In a way I’m glad they’ve kept some degree of comic relief alive even this far into the arc, and I suppose it’s either an achievement or immersion that I no longer find Fuko annoying. I actually care about what happens to her now, and probably because I think the concept or theme taps into a deep-seated fear that many of us hold, especially if we are lonely and relatively solitary as many otaku are. Key has gained enough audience knowledge and storytelling chops to make it actually work this time. My prediction (no spoilers in the comments, please) is that Fuko will die at the end of the wedding. Like in many ghost stories, the ghost can rest when her work is complete and her dream fulfilled. There will be a wedding and a funeral. All that will be left of her is the starfishes, but at the same time, people will remember who she is when they look at them. That would be a responsible and moving, if somewhat predictable, way to conclude it (ie., it’s the way I might do it were I the screenwriter!). It allows all the repressed grief that is all around to finally flow and also avoids the more horrifying conclusion of her being completely forgotten altogether, which I suspect Key knows would turn off the audience. We’ll see if I’m right in episode 9, the conclusion. Which I’m actually looking forward to now. For those who are interested: I nicked the title of this review, The End of Memory, from a short book by Croatian theologian Miroslav Volf (formerly from my school Fuller, now at Yale Divinity School). It is about the relationship between memory and forgiveness and is interwoven with personal reflections on how he tried to reconcile with the army officer who interrogated and tortured him in Yugoslavia. A lot of people have commented on the length of Fuuko’s arc, but from what I understand, it’s suppose to be the second longest story in Clannad anyway, after Nagisa’s. And throughout the arc, Nagisa herself has had way more screentime than Fuuko. I’m watching this mostly just for Nagisa’s relationship with Tomoya, which was simply fantastic in Fuuko’s arc (they’re like her parents…aww…). @Mirrinus: I’m watching it mostly for the same reason too, because their relationship is actually a lot more down-to-earth for a change, especially for a Key story. I have to say, your reviews are extremely helpful to me. I’m becoming an extreme control freak. I can’t bring myself to watch Anime, because I want it at my pace. I need to read it. I could only read books and manga (which I started because of the control freakiness), and was having constant anxiety attacks since I have been extremely curious about the stories of Clannad and ef a tale of memories. I don’t have to worry if I get a more healthy mentality sometime in the future. At least I knew what happened. For the sake of leaving a comment more on topic, I agree with you on that they managed to make Fuko not annoying at all. As with Myself; Yourself (the Hinako bit), I questioned whether I should skip the episode. On Myself; Yourself I actually did take a breather after the second Hinako episode, though. To me, that show seems to be trying too hard. It tries to make the scenes too intense, like on the third episode with the bloody knife. It lingered too long on that. It’s trying to force you to get chills instead of letting it come more naturally, which brings us back to your review. 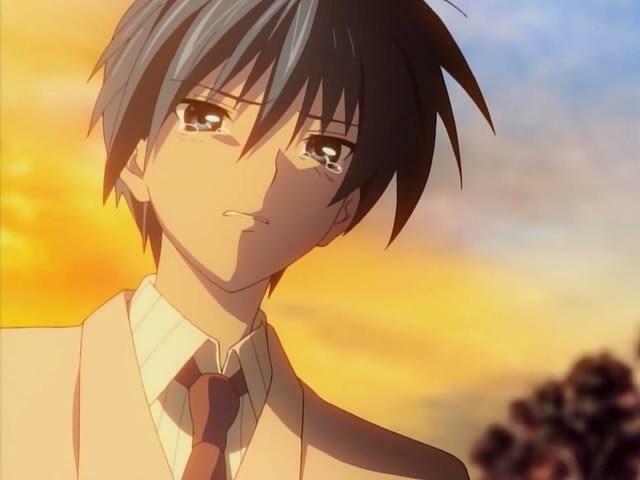 “Just show them sad situations with characters worth caring about and the tears will come on their own.” I think(with my limited experiences) that Clannad is more of a realistic show. Sure, Fuko is a sort of ghost thing that is slowly being forgotten, but the emotions aren’t so ridiculous. Take Elfen Lied, that exaggerated the emotions to the extreme. Lucy is Schizophrenic, Lucy forgot everything so she could live with Kouta, Kouta formed a complete block in his mind to forget that Lucy killed his sister and father, and when Kouta remembered, he still loved Lucy (please refrain from remarking about I Love Lucy). Of course, next to that anything seems normal. 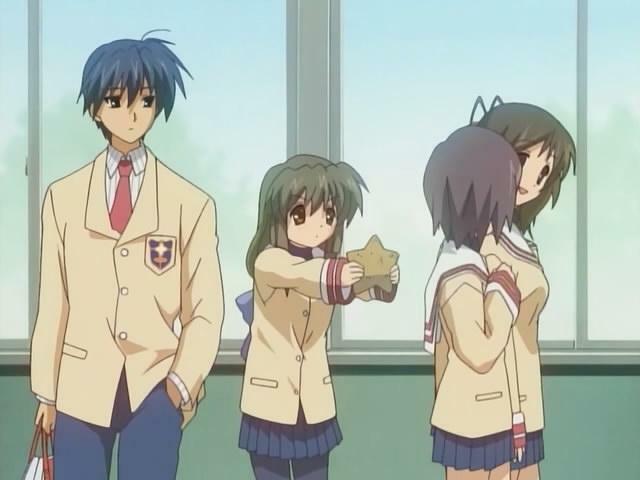 Anyway my point is, Clannad gets the double thumbs up emotion-wise. “They’ve finally learned: no need to jerk the tears out.” Opinions are much better when written out. Blah, here’s my favorite Key stuff. One> Kanon > Little Busters > Air > Clannad. I’m not at all convinced Clannad is better than the previous anime/games so don’t assume that everyone will agree with you. Many people found the fuko arc from Clannad to be the most interesting, but you they fail to mention Kanon in their post! Don’t you know that Ayu’s character from Kanon was developed far and beyond Fuko? In fact the whole Kanon story practialy revolved around that girl who was stuck in a coma. Now for the girl in a coma arc, Kanon was better. Also, let me ask, have you played One~ Kagayaku Kisetsu e~? It’s an earlier work that has the imaginary world stuff ingrained all over it, (think of a poor delinquent with family problems who gets yanked by a promise to a world that has ‘already ended”, in spring, and he even has a friend named Sumohara who acts just like Tomoyo from Clannad.) 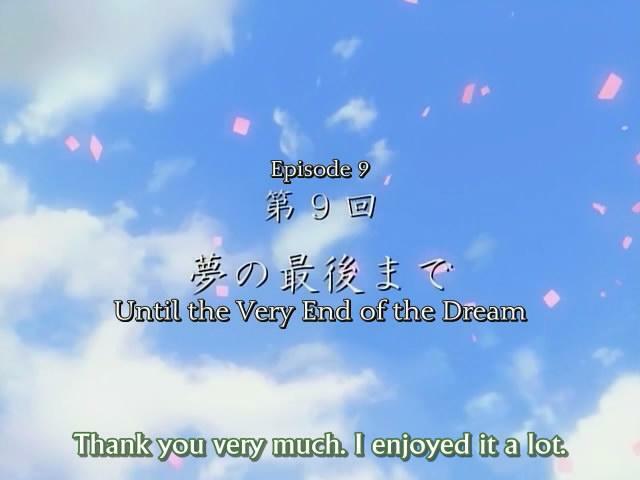 and personally I liked it better than what I’ve seen of the first season of Clannad. Unless you’ve played One and compared Clannad to One, you can’t jump to the conclusion that Key has advanced beyond it’s proto-key roots (back when the company was still called Tactics.) That game was shorter yes, but only because it removed the filler that’s in Clannad’s length. It still pulled the heart strings, but it did it in less length which is better.